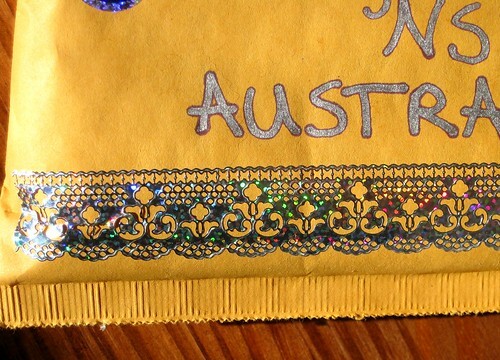 Here's another recent use of the lace deco tape I got from orientalflea on etsy. This here is the silver glitter installment, which I foresee using even more than the rest. It was the first one that merited an "ooh, must have that" thought when I saw it. Oh yes, and this silver-outlined-in-purple writing on the package came from this Pentel deco outline marker. Fun stuff. Gotta love how a slight change in angle will totally change the glitter of the bling. You can see that this is a larger version of the lady cat sticker I got from Janetstore that I featured in a blog entry last week; the stickers come in a bunch of different sizes on one sheet. I love this sassy winkin' kitty. I took these closer photographs so you can get a better look at the design of the deco tape, too. The package's lovely recipient blogged about it recently, so you can get some more views of it (and of the contents, which I did not photograph but probably should have) there. Love this!! I really love your site! Thank you for dedicating it to those of us who want to keep snail mail & the written word alive!!! 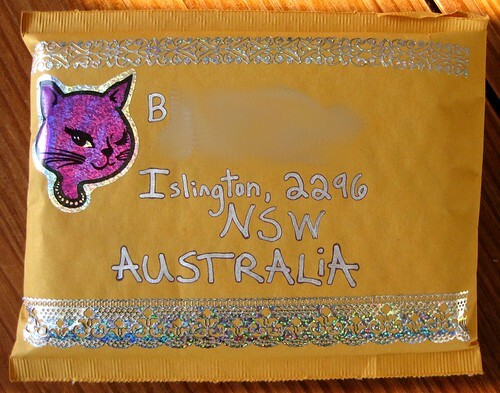 Oh my what mail art and I love it . 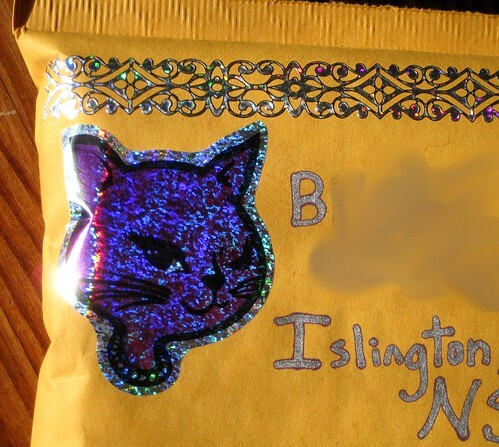 You know Im a mail art freak . LOL !!!! 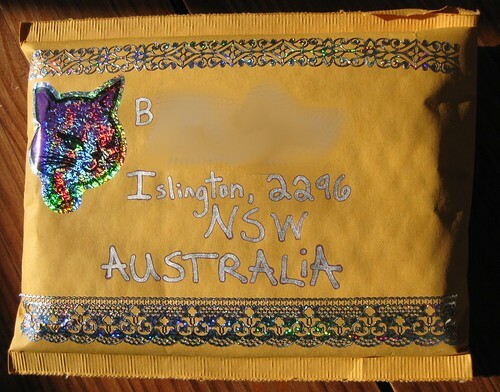 O, what a pretty parcel! I saw those pens in a store, but I was skeptical. It looks like they really work! Wow! I just clicked that link and it says that after you write, the ink colors separate...? Sounds pretty cool.